Since the late 1980s and early ’90s, the cross pollination of skateboarding and alternative music has always pushed subculture towards new thresholds of creativity and collaboration. Though not at the complete forefront, it is an accepted notion that Jazz music in particular has shared a unique improvisational bond with skateboarding. The likes of 4-wheeled magicians like Mark Gonzales and the John Coltrane-laden score for his groundbreaking part in Video Days is the pinnacle of this creative matrimony. First generational skate legends like Ray Barbee, Tommy Guerrero, Steve Caballero, and Chuck Treece are also further proof of the intrinsic union between the sonic and the skating. 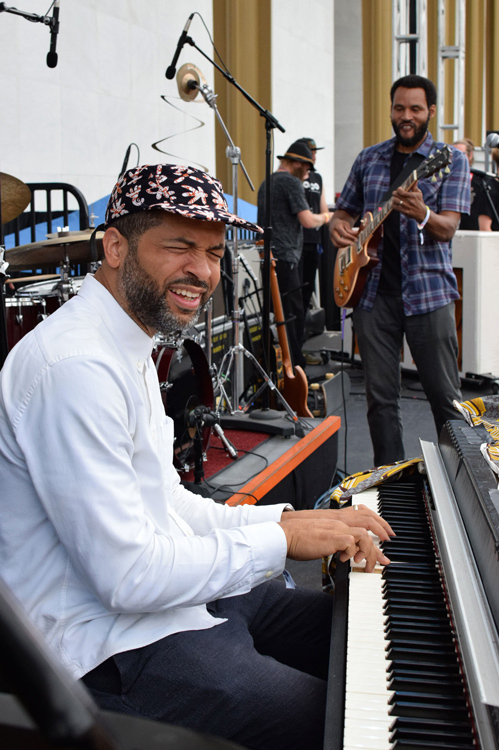 Ask contemporary Jazz pianist and renaissance man Jason Moran and he’ll verbalize it quite eloquently that skateboarding and Jazz go hand in hand. This is why the 40-year-old musician—a prodigy whose talent earned him a touring spot alongside saxophonist Greg Osby and eventually onto the legendary Blue Note record label for his solo debut in 1999—has also dedicated himself to developing his vision for a live skateboard and Jazz-infused showcase appropriately dubbed Finding A Line. The first opportunity to produce his idea began two years back in San Francisco when Jason was asked to produce an event for the San Francisco Jazz Center. 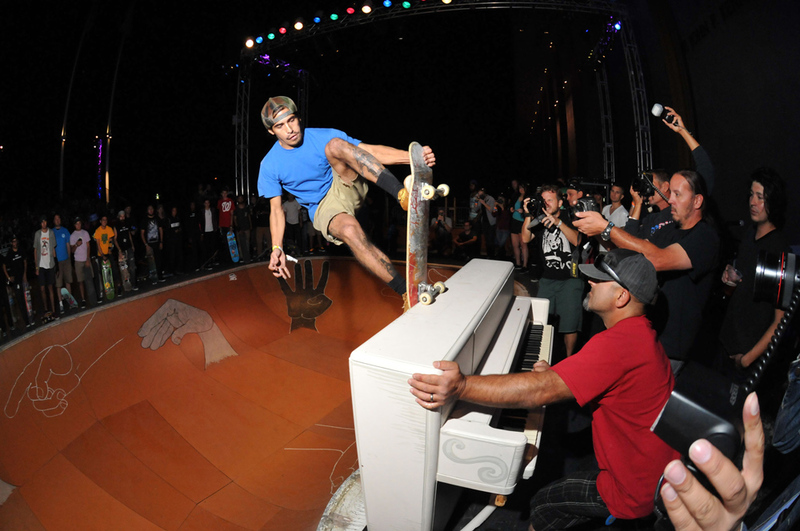 The success of the unique experience involving musicians, skaters, and a mini-ramp prompted the visionary to continue to refine and develop the concept. 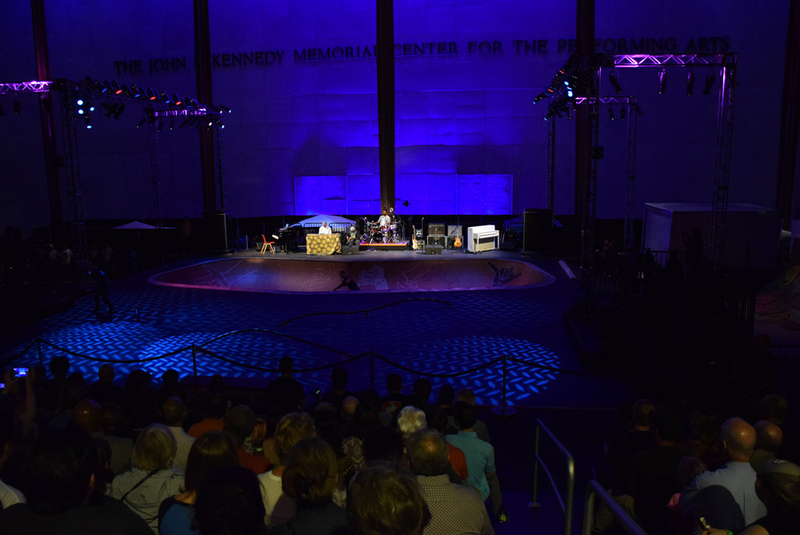 Support from the John F. Kennedy Center of the Performing Arts in Washington DC paved the way for this year’s rendition of the project, the most ambitious to date. 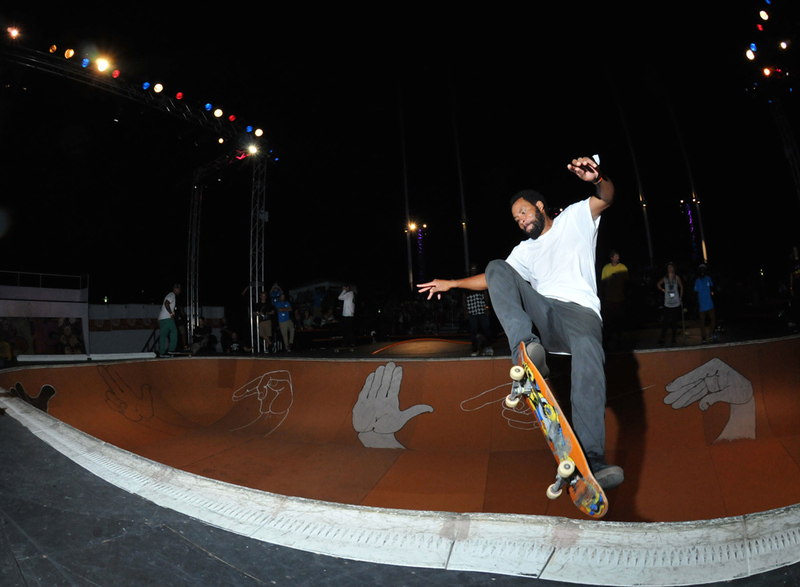 It goes without saying that the event, which went down last month, was an extraordinary milestone that heralded skateboarding front and center, an opportunity usually reserved for other “branches” of the quintessential arts. The turnout of professional skateboarders, musicians, and supporting visitors was both prolific and emotional for Jason. It was as much a victory for the cultures as it was an ode to all of the attending legends. I was able to speak with the ringleader just a few days after the event; he was fresh off of the gathering’s high, and all the way in Colorado, traveling. He had so much to recount about the sessions and so much more to say about the value and direction of the arts in America in general. It felt like Finding a Line was only the beginning for the newly independent pianist’s master plan. What did it feel like to have this year’s Finding a Line event at the Kennedy Center? It was really heartwarming. The community of creativity, especially the arts, is sometimes viewed as only a certain number of practices, whether its theater, film, dance, literature, et cetera. But to look at skating and the metaphors involved—like the determination, both physical and mental—and to have musicians join alongside them in an effort to overcome and achieve was amazing to see. To have it all come together and have thousands of people entering in and out of the Kennedy Center with skating in mind was tremendous. What can you tell me about the technicalities and ramp building for this event? I heard there were microphones placed under the ramps. It was great to have a partner like Ben Ashworth, a skater and ramp designer, involved. He designed the bowl with a big platform in the center and a way for us to climb underneath the ramps and lay mics. He also built a platform on the other side of the bowl where the band could function. The great part about that was that the band was right at the edge of the bowl. We were really close! [Laughs] It made it feel like we were dropping in whenever anyone else was. The skaters also used our small space as a place to stand and to skate. There was no barrier between the two, it was all one. Ben and my other partner Garth Ross, from the Kennedy Center, were really able to take over the space and not let this be just a side idea. We were front and center throwing down. Jason Moran and Ray Barbee. Why has it been so important for you to manifest Finding a Line? Especially in light of other more mainstream skateboard events like the X Games or Street League? Those X Games and even something like The Grammys—they’re all about the finished product and how it gets rewarded. This isn’t that. This was about dirt and process. It was loose and unrefined for the musicians. The skaters that were on the ramps or the street sections were also practicing. You rarely see that on a stage. It’s usually done in other natural environments, but rarely at a place where you buy tickets to watch. It was also to bring down some of the stress level of the skaters and the conditions. It wasn’t about one contestant and everyone watching them. I started playing the piano when I was six. Not because I wanted to, but because my brothers and I started in school and then my mother put us in lessons and that was it. It had nothing to do with our desire. It was a chore and I hated it for years. But by the end of it, something had changed. When hip-hop reached Houston, where I was living, I was listening to a lot of it. It was new and groundbreaking. I was also skating then and watching a lot of it as well. But then I heard this piano player named Thelonious Monk and it stopped me in my tracks. All of a sudden I had a mission to become like that guy. Ever since then, my path was revealed. I made the choice to dedicate all of my time and resources to play piano. There’s just something about his songs and how well they work with skating [laughs]. He just composed some melodies that were perfect. What was it about Thelonious that really made him influence you so much? One is his sound. And then I’d also look at his record covers and the style was so cool. He would be wearing a hat from Russia on one and then a hat from China in another. He had this beautiful goatee too. He had this funny way of talking and even a funny name. He was all style. He also had this way of playing with space and the piano. He didn’t play a ton of notes all the time, he left a lot of space inside them. Nobody else played like that. I didn’t have anyone else to compare him to expect for the classical musicians that I had learned about, so it was easy to fall in love with him. I just remember thinking that he was as cool as Chuck D in Public Enemy. I think it’s about the rebellious nature in all forms. Jazz is this really an abstract form of music that some people get and many people could care less about. [It’s the] same thing with skateboarding. 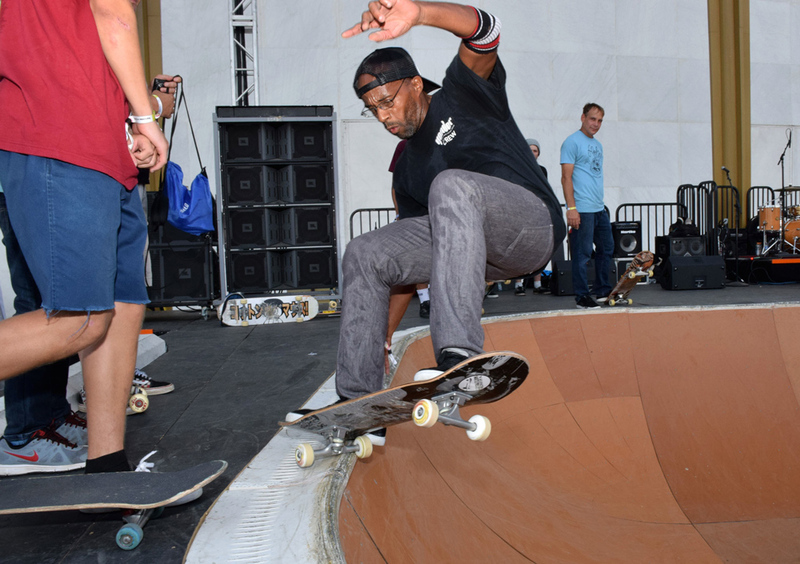 When I spoke to cats like Ron Allen, Chuck Treece, and Steve Caballero, I realized that they are a part of the early generation’s skaters that found a career in that. We’re still watching them to see how this will continue to mature. As they get older in age, skating as a practice and way of life will still continue to unfold because those guys are still doing it. It’s the same thing with hip-hop. But in Jazz, because the form is over a hundred years old, I’ve watched musicians play well into their nineties or still play before dying, so I already know that I am supposed to play until I’m dead. It was wonderful to see Ron, Chuck, and Steve come out and inspire others. What was so appealing to you about going out and skateboarding when you were growing up? The thrill of not knowing how you were going to get home that evening. Or whether [or not] your board was going to survive or what tricks would you be trying to learn for hours. New skate spots and looking at architecture in a new way was also a thrill. That was stunning. My friends and my brothers would just roll around together. We were a community that stood up for each other and cheered ourselves on and challenged one another. It’s different from something like basketball or other sports that I also played. There is so much imagination involved while skating. When you watch people like Rodney Mullen keep creating it’s incredible. When you see that, it makes you want to accomplish those feats as well. There’s a story about the first time you and your brothers visited the famous Embarcadero skate spot in San Francisco. What was that like? Our parents told us that we were going on vacation to San Francisco. My brothers and I started flipping out because we knew that so much skating was happening there. So we take our boards and my brother told us that we had to visit this place called “EMB.” When we got there, it was like Wizard of Oz and the street was paved in gold. This was the most beautiful place with curved walls. Skating there was so inspiring and the way it was laid out made you feel like you were so much better already. I felt like I could do things I would have never done in Houston. Then we would watch other skaters and my brothers and I swore we saw Mark Gonzales that day. There was one person doing all sorts of crazy stuff and we just made ourselves believe that it had to be him! [laughs] It was like we had reached the Mecca. It was unbelievable, my brothers and I [still] remember it very clearly. What can you tell me about these specific skate legends and their music/art? He was a star as a kid. When I was reintroduced to him, I was taken aback by how much time he had dedicated to figuring out the guitar. He is a real inspiration because he really takes those things as one in the same, how to improvise and how to skate, how to groove, and how to find that groove and tempo. He was really inspiring when we had our first conversation over the phone years ago about my vision for this project. He really broke it down for me. He told me that this could be good or really corny [laughs] and I appreciated him telling me that. I always give him much respect for be so candid with me. Tommy is also one of those cats that’s been revered for years for his skating. Then hearing him experiment with sound and how it relates is amazing. Some of his sound is really dark and murky like that mud and I was really surprised and thrilled. His solo stuff is pretty stunning, and then to see him jump on stage and on the board, it’s really brave! These guys are brave in a different kind of way, with their mind and their body. It’s how they live. They have to do it to stay alive. He’s like the Charlie Parker of skateboarding. Charlie created so much new language when he made Be-Bop and so much fluidity, technique, freedom, and the core. Mark skates and functions like that. Whether you’re looking at Video Days, which to me is like the greatest skate video ever, or his visual artwork. I’ve never met him, but hope to one day. He’s one of the real beacons that you can rely on to always keep it fresh and never sell out. I first learned about Chuck because one of my homies got one of his graphics tattooed on his back. So he’s been in my visual mind for decades. As a skater, he’s jumping in and out of a bowl then hopping on stage to play some drums then diving in and out again to the play some bass, then guitar. [Laughs] He’s the embodiment of it all! I had actually never met him until the show and he happened to have invited HR from Bad Brains to come out and play too. One of my dreams was to always play with Bad Brains and he connected worlds with this. I’m really thankful for his contribution. To watch his real pure love for the culture of skating and music was powerful. You’ve also been heavily influenced by Jean Michel Basquiat’s work, particularly your “Gangsterism” series. What can you tell me about that? I first saw Basquiat’s work in person during one of his traveling retrospectives. I must’ve been about 18 years old. I was listening to a lot of John Coltrane and obscure Blue Note records during that time and to see him reference Jazz in so much of his work was interesting. The nature of improvisation is so apparent in how he put materials and colors together. His use of form and symbols was also powerful for me. What I wanted to do was put a series together that looked at how he crafted things together. The Gangsterism pieces come from that, looking at materials in a different way. He’s always been a resource for me. There was recently an exhibition in Brooklyn of his notebooks. It was unbelievable to read his notes and see the mind that all these years later is still captivating like a Monet or Picasso. There’s something about being a rebel that people fall for, whether they become one or watch all the movies about them. Why do we love all the movies about the bad guy? [Laughs] I think what Basquiat continues to represent is the nature of how he went against the grain in how he worked as a painter, a creator, and a band member. As a person who did things in private and also took spray paint to the walls of New York City in public too. There is something about being that rebellious that I always find beautiful when it’s done in a good way. Skating can be the same way, Jazz too. It’s music that a lot of folks could care less about, but many of us around the world do and we keep it alive. We really decide to do things without regard to the rules or we change the rules. Basquiat had a piece called “Hollywood Africans” and I used to have a poster of it on my wall. He has a lot of things written on the painting, but the one that stood out the most to me was “Gangsterism.” And the first piece I wrote was called “Gangsterism On Canvas.” He changed the rules of the game. Even though he died so young, people still look to him the same way they look to a Malcolm X or James Baldwin. They are gangsters in a way, not in a going to jail way, but just changing the mindset for elevation. 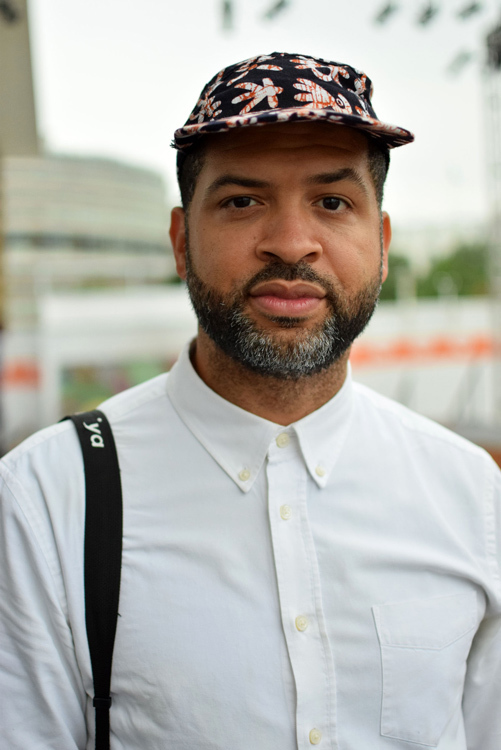 Jason Moran. Photos by Ray Llanos. Were you ever into Jazz-centric hip-hop groups like De La Soul or A Tribe Called Quest? Of course! Native Tongues went totally against the grain. Not that they didn’t use the rules that were set up in hip-hop, but they really changed things up to show that not everyone was the same. All the skits that Prince Paul made with De La Soul or the way A Tribe Called Quest dug into the groove, but really consciously acknowledged Jazz as an aid, the way Stetsasonic did, all of them were really thinking creatively about their form. That was also happening during the same time that everyone was skating during my era. Skating, listening to Native Tongues, and listening to Jazz was an energy happening in the ’80s that was really powerful and is still resonating now. How have things changed for you musically since you officially began your career with Blue Note in 1999? Back then I had a vision and was just focused on making sure that I could get it out for people to hear it. It was about the piano and what I could do. Now at my age, I’ve parted ways with Blue Note and feel really free with opportunities to gather people and thinkers together to create because of the wide array of professionals that I’ve collaborated with, whether it’s visual artists or scores or skaters or dancers and the Kennedy Center. Right now, it’s about wondering how music will intersect the world and not just from the perspective of musician and audience. I mean really embed itself in the communities, so that Americans can depend on the arts as a source of energy. That’s where my head is right now and the gospel that I’m working to spread. Finding A Line is a way for us to consider that discussion in America about our relationship with art and how we create. That’s what I’m concerned with. I’m [also] thrilled that I’m in a position to go into the studio and make a record. Then if I want to give it to someone like Chuck Treece, I can say to him, “If you make another video, here’s some music for it, I own it, it’s mine!” [Laughs] All those years with Blue Note Records got me to this point, where I feel like I can stand on my own because I know how to do this now.